An extraordinary gamma-ray burst, known as GRB110328A, has been observed by a team of NASA telescopes (Chandra, Hubble, and Swift). 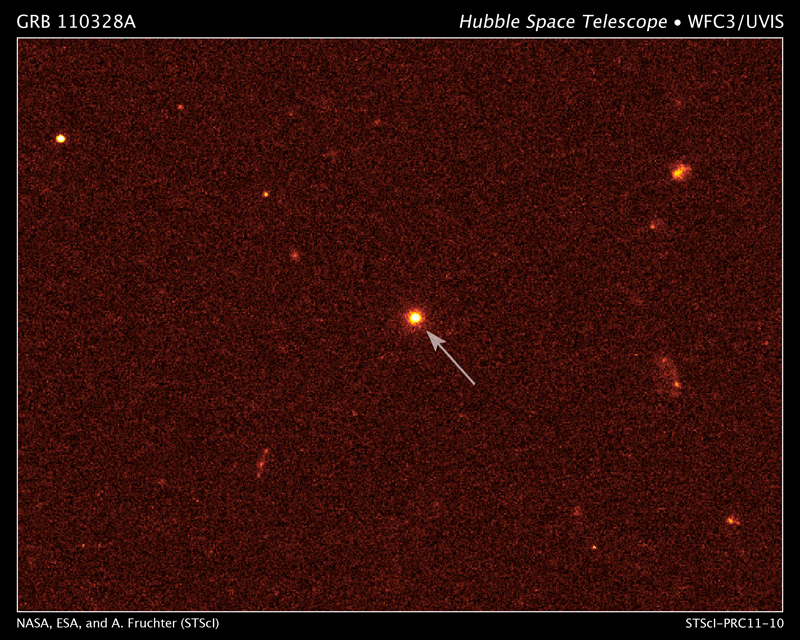 The source of GRB110328A appears to be a galaxy about 3.8 billion light years from Earth. Early analysis of the data suggests the burst may have been caused by a star torn apart by a supermassive black hole in the galaxy's center. The Chandra data pinpoints GRB110328A in the core of this galaxy and shows that the associated X-ray source is very bright and long-lived. The center of this image contains an extraordinary gamma-ray burst (GRB) called GRB 110328A, observed with NASA's Chandra X-ray Observatory. This Chandra observation confirms the association of GRB 110328A with the core of a distant galaxy and shows that it was an exceptionally long lived and luminous event compared to other GRBs. The red cross (roll your mouse over the image above) shows the position of a faint galaxy - located about 3.8 billion light years from Earth - observed with NASA's Hubble Space Telescope and the Gemini-North telescope on the ground. Allowing for experimental errors, the position of the galaxy is indistinguishable from that of the X-ray source, showing that the source is located close to the middle of the galaxy. This is consistent with the idea, suggested by some astronomers, that a star was torn apart by a supermassive black hole at the center of the galaxy. This idea differs from the usual interpretation for a GRB, involving the production of a jet when a black hole or neutron star forms after the collapse of a massive star or a merger between two neutron stars. Remarkably, this "tidal disruption" event may have been caught in real time, rather than detected later from analyzing archival observations. However, this X-ray source is about a hundred times brighter than previously observed tidal disruptions. One possible explanation for this very bright radiation is that debris from the disrupted star fell towards the black hole in a disk and the swirling, magnetized matter generated intense electromagnetic fields that created a powerful jet of particles. If this jet is pointed toward Earth it would boost the observed brightness of the source. This scenario has already been suggested by observers to explain the bright and variable X-ray emission observed by NASA's Swift telescope. This observation was part of a so-called target of opportunity, or TOO, led by Andrew Levan from the University of Warwick in the UK. A TOO allows the telescope to react quickly to unpredictable cosmic events, within 24 hours in some situations. Chandra scientists and engineers can decide to alter the scheduled observations and instead point the telescope to another target if the circumstances warrant it. This process was put into place once the discovery of GRB 110328A with Swift was announced on March 28th, 2011. The Chandra team was able to reset the telescope's schedule to observe GRB 110328A early in the morning of Monday, April 4th for a period of just over four hours. Coordinates (J2000) RA 16h 44m 49.91s | Dec +57° 35´ 00.60"
This sentence puzzles me "Remarkably, this tidal disruption event may have been caught in real time, rather than detected later from analyzing archival observations". How can the observation of an event taking place 3.8 billion light-years away from us be caught in real-time? As far as I understand it, we're only seeing the light that gets to us 3.8 billion years after it happened as the light travels towards us at most at the speed of the light. Is it possible that very little matter accreted onto the smbh? Extant to the event horizon the gravitational energy and frame dragging of the relativistic spin of the smbh would creat a fission horizon a fusion gap and a qgp floor. Looks like the fusion gap might be the process. The coordinates of the gamma ray source are in the Fast Facts: RA 16h 44m 49.91s | Dec +57� 35' 00.60"
Thanks for your question. The workhorse right now for discovering gamma-ray bursts (GRBs) is NASA's Swift satellite, which discovers about 100 GRBs per year. The actual number of GRBs in the Universe will be much higher than this, because only the brightest objects will be seen at great distances. Thanks for your question. All of the electromagnetic radiation from this event has traveled at the same speed - light speed - from this event. It's only the use of the redshift determination that gives the distance in this case. Is it possible to correlate these events across the various radiation frequencies in order to compute the distance based on the differences in propagation rates in order to compare to red shift. I have found Gamma-ray Burst fascinating. I have read a few books about them, but do not know if I really understand completely about them. How many of this type of burst occur in our universe on the average? Nobody seems to accept that neutron star collisions is a very weak solution to GRB's, especially short ones. Almost everyone accepts this theory. I do not. Short GRB's may give us a window into 4th dimensional activity which should be investigated. If brane theory is correct, I suspect we are witnessing their interaction. Show me the merging black holes and then the resultant GRB and I will forbear. Otherwise daily black hole/neutron star mergers are too silly to be believed as the cause of short GRB's! 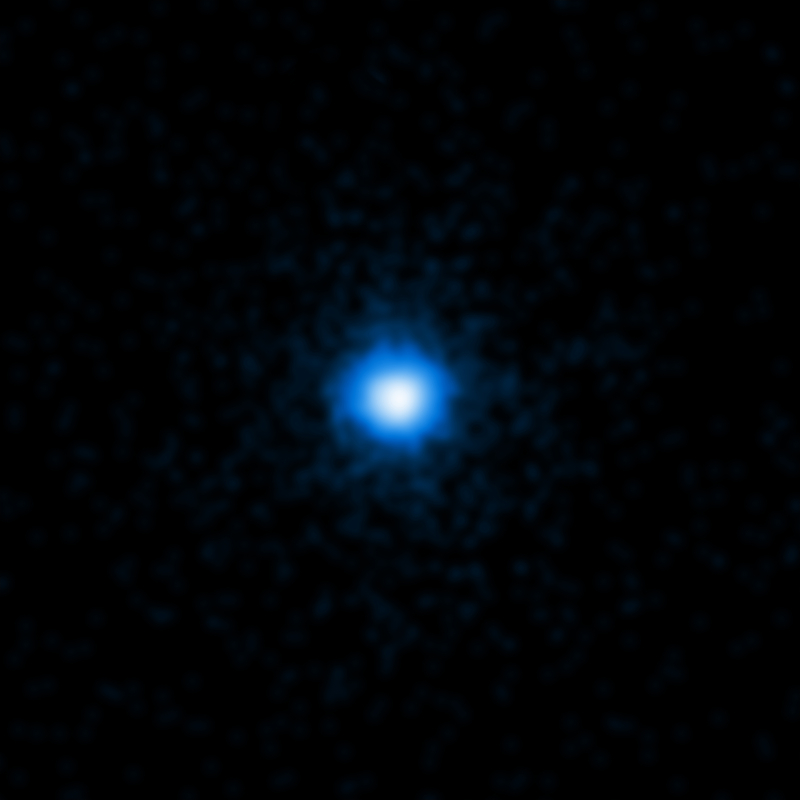 A gamma-ray burst known as GRB110328A. 3.8 billion light years from Earth. X-rays from Chandra's High Resolution Camera. In the constellation Draco, visible from Northern Hemisphere.